Mr. Eric Charles Wilkinson was born February 9th, 1941 in Tuxford, Saskatchewan. Eric was the oldest child born to John Priestley Wilkinson and Christina Jessie Wilkinson (née: Gellan). He was predeceased by his parents, John and Christina Wilkinson; wife, Marlene Wilkinson (née: Pilsner); and son, Randy Wilkinson. Eric’s passing now leaves behind: daughters, Rhonda Shaw (Sam) and Michelle Dumaine (John); daughter-in-law, Deborah Wilkinson; brother, Lyle (Cheryl) Wilkinson; sister, Eileen Mayo; grandchildren: Melissa Chelsberg (Bryce), Lindsay Mahon (Eric), Mason Shaw (Kristen), Haley and Mia Dumaine, Shelby and Ashley Wilkinson. He enjoyed times with the great-grandchildren of Sawyer and Boston Chelsberg, along with Liam, Lachlan and Hendric Mahon. 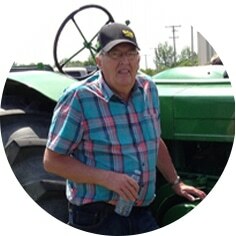 Eric was raised on the family farm near Marquis, SK, until he later moved into Regina, SK after meeting Marlene and started a family with the birth of Randy. Eric worked as a welder for numerous years before the calling of the family farm brought him back. The birth of Rhonda and Michelle followed soon. Eric was a passionate farmer with a love of the land and animals. He was always there to give a helping hand to neighbors and friends. Eric volunteered numerous hours at the Tuxford Rink between making and maintaining curling ice and helping with the numerous bonspiels. After retirement, Eric and Marlene enjoyed the winters in Mesa, Arizona where they played cards and had the occasional happy hour. Eric took great pride in his vehicles, whether it was his John Deere tractors or his GM truck. Eric will be missed by the people he leaves behind and the lives that he touched. Special thanks to the staff of Chez Nous for all the great care, support and lunch time meals. In keeping with Eric’s wishes, a Private Family Graveside Service will be held at a later date. Arrangements are entrusted to Moose Jaw Funeral Home, 268 Mulberry Lane. Michelle Surtees Funeral Director 306-693-4550. My family and I offer condolences to Eric’s family. We pray for God’s comfort and strength in this time of sorrow. We are so sorry to hear about your dad. We are thinking of you. I remember when he was a young man and he and his sister would come to Chamberlain to visit his cousins. My sincere sympathy to all of you at this sad time. So sorry to hear about Eric. We had a lot of fun times with Eric and Marlene. Cherish your fond memories . Our deepest condolences on the loss of your father. May you find comfort in your memories. He has now been reunited with your mom and brother. Sincere condolences to the family. Eric and Marlene were always a joy to be around . I will remember our trips to Craven . Please accept our heartfelt condolences on Eric’s passing. I had ran into him lately a couple of times and had a great conversation with him. He will be missed. Great picture of Eric, and very fitting! Our sympathy to the family. You will be in our thoughts. Your parents were great neighbours, and will be missed! So sorry to hear of Eric’s passing. Condolences to all the families. Sorry to hear about Eric,we will remember him for his good nature personality,he always had time for a chat and a laugh or two when we would see him.